Hope you are all having a great week, we are loving the snow here and 2 days of school closures so far means we have had lots of fun in the snow hooray! As promised, I am now sharing the final of the 3 projects that we made at the team training event that I attended in February. I always enjoy crafting and as a holder of regular workshops, it is a lovely chance for me to learn something new, or just enjoy putting together a project or card that someone else has lovingly designed for us and this project was just that! The lovely Michelle Last put together this gorgeous notecard box that holds 3 of the new narrow notecards with envelopes. The notecards measure 2.5" x 4.5". 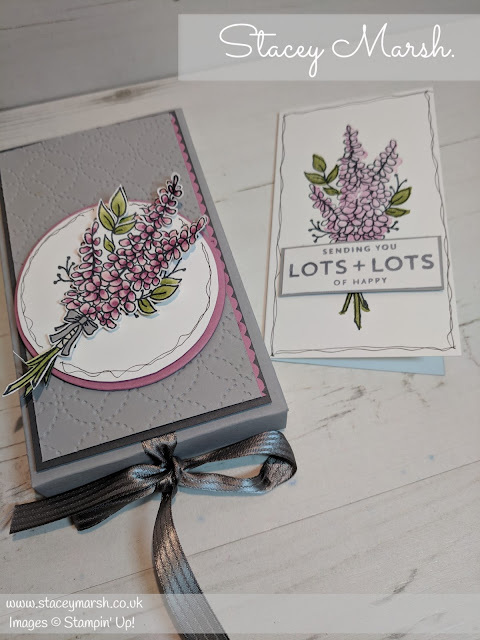 Michelle has designed the box around the FREE Lots of Lavender Stamp Set which has 2 options for colouring - you can either use the stamp set as it a two-step stamp set, or colour with your choice of colouring tool. For this set I have used Stampin' Blends to colour the Lavender image on the front of the box, and the stamp set for the notecards inside. If you like this stamp set, it is only available until the end of March with orders of £45. Orders can be placed online or directly through me. I wonder what projects Michelle will put together for the next training event.....?